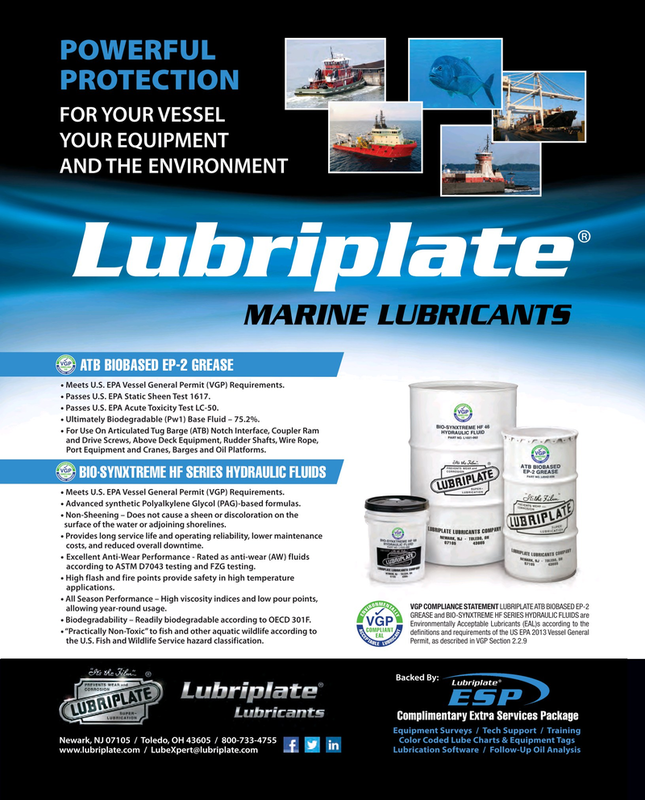 Lubriplate MARINE LUBRICANTS ATB BIOBASED EP-2 GREASE • Meets U.S. EPA Vessel General Permit (VGP) Requirements. • Passes U.S. EPA Static Sheen Test 1617. • Passes U.S. EPA Acute Toxicity Test LC-50. • Ultimately Biodegradable (Pw1) Base Fluid – 75.2%. • For Use On Articulated Tug Barge (ATB) Notch Interface, Coupler Ram and Drive Screws, Above Deck Equipment, Rudder Shafts, Wire Rope, Port Equipment and Cranes, Barges and Oil Platforms. BIOSYNXTREME HF SERIES HYDRAULIC FLUIDS- • Meets U.S. EPA Vessel General Permit (VGP) Requirements. • Advanced synthetic Polyalkylene Glycol (PAG)-based formulas. • Non-Sheening – Does not cause a sheen or discoloration on the surface of the water or adjoining shorelines. • Provides long service life and operating reliability, lower maintenance costs, and reduced overall downtime. VGP COMPLIANCE STATEMENT LUBRIPLATE ATB BIOBASED EP-2 allowing year-round usage. GREASE and BIO-SYNXTREME HF SERIES HYDRAULIC FLUIDS are • Biodegradability – Readily biodegradable according to OECD 301F. Permit, as described in VGP Section 2.2.9 the U.S. Fish and Wildlife Service hazard classification.